How do I combine closed shapes' paths in Illustrator? I'm hoping this isn't a "doh" answer as I've been looking for quite a while to find an elegant solution. I'm trying to merge two shapes together that are placed right next to each other but not overlapping. Essentially I want to combine the overlapping strokes as the goal is to laser cut the shapes most efficiently. Here's a close-up screenshot of my file. Note that I'm in Outline mode (CMD Y). The selected shape is a block letter "C" and the shape on the left is just a rectangle. Since both have perfectly vertical lines and the lines are perfectly overlapping (I've verified this in the Transform panel), what's the best way to make these lines the same? Obviously I can pathfinder the objects together and then manually add a single line to replace it, but this would take quite a bit of time. I'd prefer to have a simple solution as I have a LOT of letters to combine. Thanks in advance for any help you all can provide! P.S. Using the lastest 2017 release of AiCC. The key factor may be that anchor points in Illustrator can only have 2 paths... and in and an out. You just can't create an anchor point with 3 paths shooting out of it. That may or may not factor into what you are trying to accomplish. In most cases you can merely overlap the paths. Two 1pt strokes on top of each other visually equals a 1pt stroke. Granted, alignment is crucial. This, generally, is what many artists do. Visually you can't tell there are 2 overlapping paths. I do not know if that's an issue with a laser engraver though. It's never an issue on commercial printing presses and platemakers. The other option is to manually delete path segments which overlap. This depends upon overall artwork construction though. Filled shapes should always be closed. So you may need a shape for a fill, then individual separate strokes for any key line. It's hard to tell without seeing the full artwork and its construction. If you are dealing with a bunch of filled paths (or a quick way to make all paths align perfectly), you can select everything and possibly use the Merge button on the Pathfinder Panel. This will combine areas of like appearance and subtract (delete) any portions which are covered by an overlapping shape. Again, whether or not this is useful depends upon the artwork. So.. in short.. there's no quick and easy way to just automatically tell Illustrator to delete any path with overlaps another path. In the end, it pretty much always takes human intervention to get things right. Not the answer you're looking for? Browse other questions tagged adobe-illustrator vector path laser-cutting or ask your own question. How to join two overlapping non-end points that belong to two paths? Illustrator CC: how to join lines without closing? 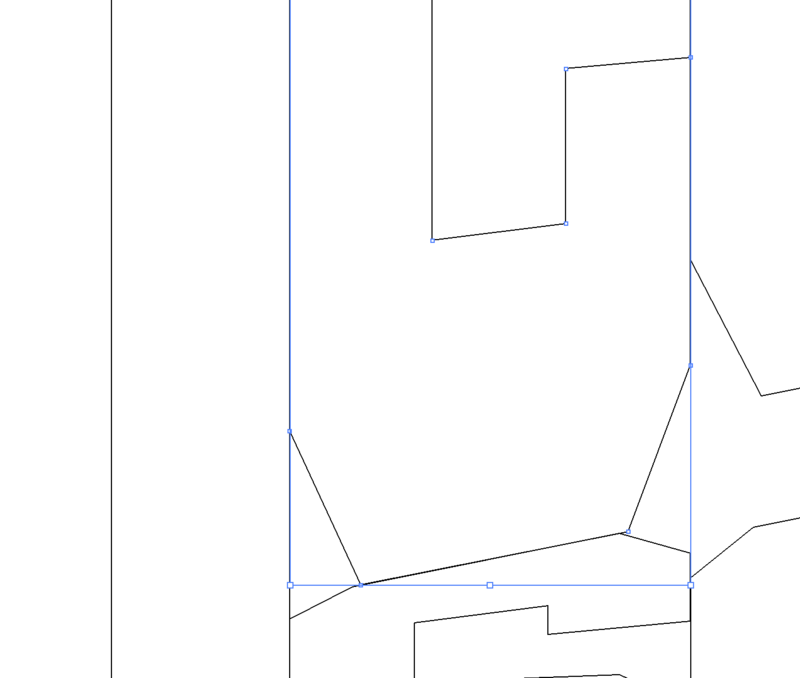 Illustrator: A way to merge overlapping lines of adjacent shapes?